Congratulations to the newest inductees of the National Honor Society. 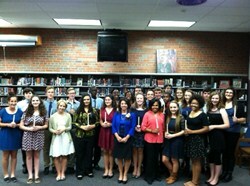 Last Thursday evening, 27 juniors and seniors were inducted in the Charles F. Brush Chapter of National Honor Society. The National Honor Society was honored to have Superintendent, Linda N. Reid, as its keynote speaker for the induction ceremony. Being inducted into the National Honor Society is a very prestigious honor. In order to apply, students need a minimum of a 3.5 GPA, 50 community service hours, and significant evidence of participation and leadership in school and community activities.